Should You Change Parts On a Classic Muscle Car? Last week was a big week for this old boy. It was a double super secret week but now I can tell you what happened. First, my brother was in town for a very important mission. To play golf at one of the hardest courses we know and to replace the carb on my Road Runner. Ok, just so you know, every trip my brother makes it must involve a game of golf or he is not showing up. 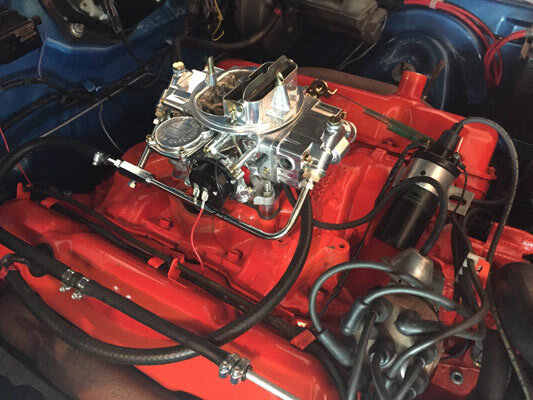 So, I bought a new Holley 750 carb and of course like everything else I buy someone has another opinion. Yep, I leave my truck patina and the comments I get is I should paint it. I bought a Shelby after years of wishing and dreaming and I am told I should have bought something else. I left my Road Runner original stock and I am told I should add chrome wheels and such. I put chrome wheels on my other Mustang GT and I am told I should have left the originals. I cannot win. So, from here on out I have two answers for all the geniuses who want to tell me what to do. First, it’s mine and I paid for it. Two, why don’t you buy one and do what you want to. Gadzooks I get tired of opinions and criticisms all the time regarding my stuff. Go get your own stuff and leave me alone! Jeepers. But, with that comes a pleasant surprise. I have had several people of late find me a storage building or two. That, I like because it shows these real friends are looking out for me. For that I am grateful. One guy in particular with a pile of his own kids is my biggest supporter and I am grateful. But, the search is over. Surprise number two is I found a garage that is fourteen bays and I am going to add a lift to it. Pictures will be released soon but not the location of course. Lastly, my brother advised me he is 85 percent done with my Model A. Jiminy Crickets it will be fun to have it in my stable soon. And, golly, he installed my new Carb on the RR. He took the old carb and I already bought a rebuild kit for it. I want him to rebuild the old one and have it ready in case. But, this new Holly is very sweet. It made an immediate positive change to the performance of the car. It was a very hot day that day and the humidity was very high. I was literally sweating gallons as he stayed hunched over the fender for a long period of time to make the necessary corrections. He did not gripe or complain but he stayed focused on his task at hand. It bothered me greatly I was not the one replacing the carb like I did so many times before but it is was it is. So, much was accomplished during the secret week. A new place to store cars year round, a new carb for the RR, and a few other things I cannot mention here. Related ItemsShould You Change Parts On a Classic Muscle Car?